Old school rubbing compounds, rotary polishers, and wool pads just don’t work for modern paint finishes, so Chemical Guys came up with V36 and V38 polishes. These new water-based paints with clear coats are friendly to the atmosphere, but show every swirl and scratch. Chemical Guys came up with these advanced polishing compounds to evolve with the automobile industry. 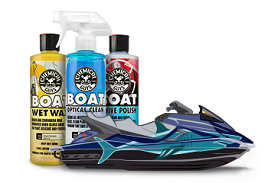 V36 Optical Grade Cutting Polish is the first optical grade cutting polish to use precision diminishing abrasives to eliminate light to moderate paint defects and imperfections. V36 is blended with optical-grade micro abrasives that remove paint imperfections and defects, then finish with the clarity and precision that perfectionists demand. V36 cuts hard to remove moderate swirls, scratches, oxidation, and restore luster and gloss to sun-faded paint. V36 contains no fillers or oils, so the results you see are the results you get. When only perfection will do at the end of a polishing detail, detailers reach for Chemical Guys V38 Optical Grade Final Polish to refine depth, luster, and gloss. 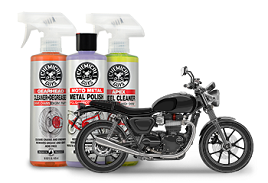 V38 refines compound and polishing marks from prior steps, and enhances reflection, shine, and gloss on any paint finish. V38 works on conventional clear coat, ceramic clear coat, and single stage paint finishes. 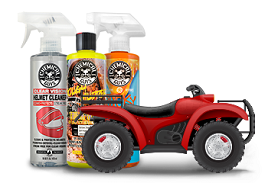 Use the full V-Line Kit to restore paintwork, clear optical plastics on headlights and tail lights, wheel finishes, carbon fiber, and any other exterior car part that is shiny or clear. The refined micro-abrasives of the V-Line come in coarse compounding grits, and refined polishing grits that can remove wet-sanding marks with just a dual-action polisher.